Last Tuesday perfection ensued once again, as I rolled the 8th perfect game 300 of my illustrious bowling career After struggling for the past few months…ever since the last couple of weeks, I’ve been much more consistent with my release which is a big confidence boost. Confidence in your game is a huge key to stringing a ton of strikes and posting persistent high scores. Unfortunately for me, this ebs and flows on a monthly or bi-monthly basis.. or at least it has in the past couple years it seems. I could streak together quite a few 650+ series… and twice since I have moved to Dodge City I have bowled two 300 games in a span of just a couple weeks….only to follow it up the next month or two with some horribly pathetic low 500 to 550 series with far too many sub-175 games. I’m finally getting around to writing about the big Great Plains blizzard early last week. 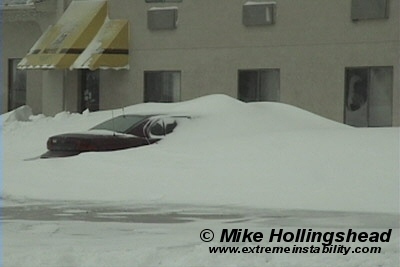 It was essentially a non-event for here in Dodge City, but we really didn’t miss this winter fun but very far… for areas near I-70 in northwestern Kansas were about the southern extent of this far-reaching major blizzard. The storm lasted from roughly mid to late afternoon on Sunday the 27th and continued through the day on the 28th before winding down early on the 29th. Widespread 50 to 70mph winds existed from western Kansas through most of central Nebraska into central and eastern South Dakota. By the storm’s end, the largest snowfall amounts were in the foot to foot and a half range…mainly from north central Nebraska into south central South Dakota. 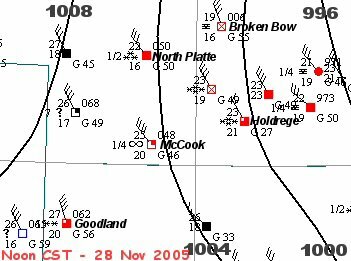 This is also coincident of the strongest winds during the event…where severe blizzard conditions lasted a solid 24 hours at some locations. A storm chaser friend of mine, Mike Hollingshead (http://www.extremeinstability.com), actually chased and documented the event. You don’t really “chase” these kind of weather events, per se… but just document the events as they unfold near your location. Much like my heavy snow chase along the Front Range in Colorado on October 10-11 a couple months ago. Some of the towns and cities that took it on the chin with this storm…with blizzard conditions being reported at least 12 hours or so…included Goodland, KS…North Platte, NE…Broken Bow, NE…Ainsworth, NE…O’Neill, NE…Winner, SD…Pierre, SD. This was certainly a large scale event stretching some 600 to 700 miles from northeastern Colorado into the eastern Dakotas. It was a storm that actually unpredicted…to an extent. There was a general consensus some 5 to 7 days ahead of time that there may be a winter storm of some sort…somewhere on the plains…towards the end of the Thanksgiving holiday. None of the models, however, predicted the ferocity of this event until maybe 2 days out…if that. Some of the short term models didn’t catch on to the explosive deepening of the storm until Saturday (26th) afternoon! I bolded Ainsworth, NE above because if there was one town that got about as clobbered as any in this event…it was Ainsworth. See the weather observations below. Below are some of the awesome observations during the storm (every 3 hours through the blizzard…in coded METAR format). I’ve done some research on historical blizzards since 1948 over the past couple of years, and I must say this one stacks up there as one of the true classic large-scale Plains blizzards. Mike Hollingshead was in O’Neill, NE…which is about 65 miles east of Ainsworth. He experienced some incredible conditions. You can read his account and see his images here.